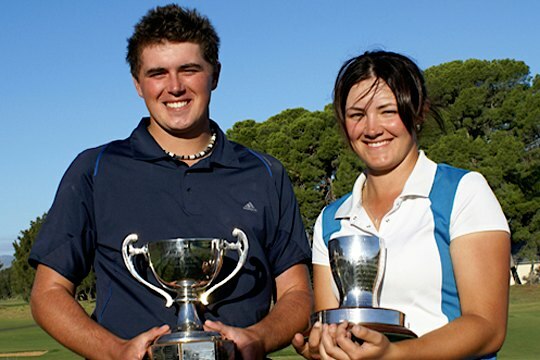 Brad Moules and Sarah King have won the 2011 SA Men’s & Women’s Amateur Championships after an exciting day’s golf at Glenelg Golf Club. The men’s final proved to be a tense affair, with the match going all the way to the 36th hole with Brad Moules winning 1 up over Chris Austin. In the Women’s final, the experience of Sarah King came to the fore as she held off a plucky challenge from local teenager Jenny Lee, winning the match 8 & 6. The Men’s Amateur final was always predicted to be a tight contest and little separated state representatives Moules and Austin following the mornings first 18 holes, with Moules going to the break holding a one shot lead. The afternoon session looked like it was going to belong to Moules, who extended his lead to 5 holes through the afternoon’s front nine. There was plenty of drama to follow however, as Austin quietly went about winning four of the next five holes to shave his opponents lead to a single hole on the 32nd. From there the context seesawed, with Moules winning the 33rd only to surrender his 2-hole advantage back to one after missing a short par putt on the 16th. With the 17th halved in 4s, both players adopted a conservative approach up the par five 18th, where Austin was unfortunate to put his chip shot through the green and allow Moules the luxury of having two putts for the halved hole and to take the match 1 up. In the Women’s final, Sarah King got off to a flying start with a birdie at the first, and further asserted her dominance over Jenny Lee through the morning’s 18 holes in going to the break 6-up. While Lee played some competitive golf in the afternoon session, at one stage winning back two consecutive holes and being extremely unlucky to see a putt lip out on the next, the task was also going to be tough against the experienced King who displayed a sure touch on and around the greens. She closed out the match with a solid par in the par-512th hole to take the contest 8 & 6. Today’s final of the Women’s Bronze Cup also proved to be a competitive affair, with Jillian Gehling defeated her fellow Glenelg member Cheryl Franzi 5 & 4.